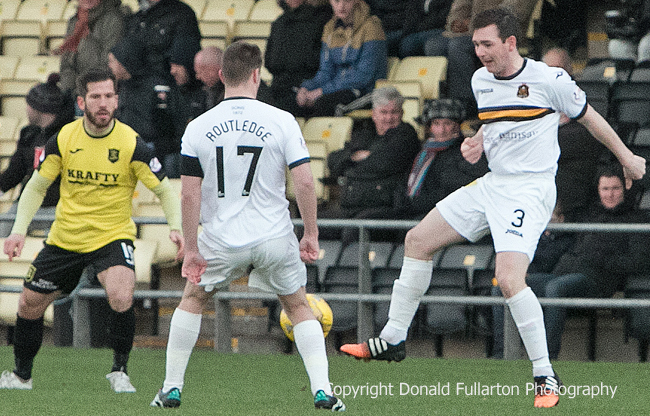 DUMBARTON secured an important three points with a 1-0 home win over Livingston at the Cheaper Insurance Direct Stadium. DUMBARTON secured an important three points with a 1-0 home win over Livingston at the Cheaper Insurance Direct Stadium in front of a 760 crowd. In very cold and windy conditions the game was considered doubtful until the first whistle, which followed a well observed one minute silence for Dumbarton chief executive Gilbert Lawrie, who died suddenly nine days earlier. In the first half Sons faced the gale, and resolutely achieved their target of not conceding a goal. In fact they came close to scoring on several occasions. After the break it was Livingston's turn to face the wind, and they too battle bravely and testing keeper Jamie Ewings on several occasions. The game's only goal came early in the half when, for the second time in a month, full back Mark Docherty (pictured) used the wind to score direct from a corner kick. After that Tom Walsh, Garry Fleming and Grant Gallagher spurned opportunities to add to the lead, as did debut man Kler Heh, born in Thailand, who is on loan from Sheffield United.